There’s a little over a month remaining in the school year, and if you’re anything like me, it’s right about this time that your repertoire needs a boost. Whether you work as a music therapist in the classroom or one-on-one setting or you are a music educator, my newest creation might be just the boost you need. Purchasing the lead sheet and mp3s for each individual song would cost you $3 a pop; multiply that by 12 songs and you’re out $36. But since I’m all about sharing the love, I’ve priced Tapping, Shaking, Music Making! at a mere $12. Get it now and instantly increase your arsenal of songs. Week 32 – Featuring Baby Shower #1! Week 32 rolled around while we were on vacation, and I loved telling people that I was eight months pregnant. It sounds so far along, even though I still have two entire months to go! The day after we returned from vacation, I had my first baby shower. It was hosted by Deb Watts (our family friend and accompanist for my church chorale) and attended by the members of our chorale. Of course, Baby Rambach was the main topic of conversation — I never get tired of talking about him — and I got to hear lots of baby stories from experienced moms and grandmas. Such a fun shower, and I was extremely grateful to my lovely host! Our giant basement closet is currently serving as the depository for all things baby-related, since we don’t want it all piling up in the nursery. I still have two showers to go, and already I am a little overwhelmed by the gigantic pile of clothes, blankets, toys, and necessities. I guess I better just get used to it, huh? After a year filled with amazing travel adventures, it’s pretty hard to believe that we’ll never again take a trip either without our little guy or without leaving him in the care of his grandparents (and missing him like crazy, I’m sure). So we called our vacation in southern California our “last hurrah” — and we definitely made the most of it! While I would be perfectly happy just lounging by the pool or at the beach the entire time, there’s never a dull moment on vacation with Zach. We saw lots of sights, did quite a bit of walking and exploring (including conquering “Heart Attack Hill” in Dana Point…not sure how my doctor would feel about that one at 8 months pregnant), and got tons of great photos along the way. The “bump” was featured in quite a few of those photos, you know, just so that someday we can prove to Baby Rambach that he was indeed quite the traveler even before he was born. We took a day trip to Catalina Island, and it was absolutely gorgeous. Zach went to town photographing the boats and scenery, and I loved the cute little town with all its shops and history. The nausea-inducing ferry ride there was well worth it, after all. The last three days of the trip were picture perfect weather-wise, so I got my pool and beach time :) The first beach we visited was in La Jolla, where this photo was taken. On the last full day of vacation, we headed to Coronado Island to visit the Hotel Del Coronado, where we stayed last time we were in San Diego. We hung by the pool, had lunch on the deck, and then sat on the beach before heading back to La Jolla. It was a wonderful week from start to finish! Of course, it was a little difficult coming back to reality, but we had a very happy puppy waiting for us at home and I had my first baby shower the very next day. The next vacation we have planned will be WITH the baby! We’re going to Naples, Florida in August to visit my grandma, and she’ll be meeting him for the first time. Now that will be an adventure, for sure. I have been on an “instrument song” rampage lately! It seems like I go through cycles when it comes to choosing song topics, and all of those instruments stashed throughout my studio are currently getting plenty of use. I went back to the basics — good old rhythm sticks — with my latest song, because there is just so darn much you can do with them. As far as addressing goals and objectives, the possibilities for motor development are endless. At one of my classes recently, the mom of one of my tiny kiddos commented on how much progress she had seen her daughter make when manipulating a pair of rhythm sticks. 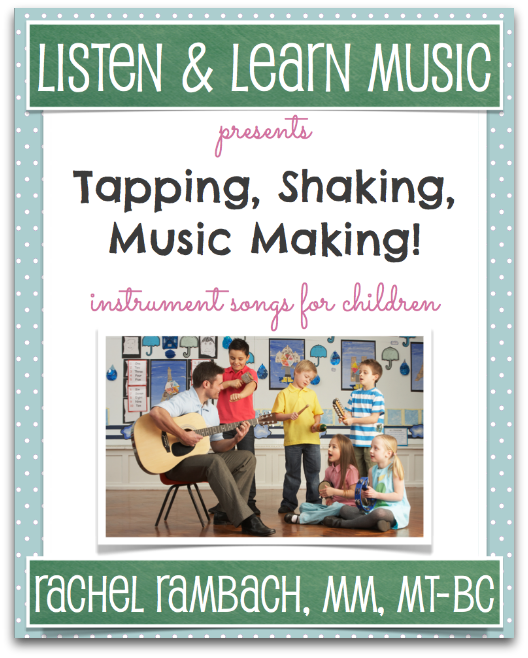 1-2-3, Tap With Me offers specific directives for playing the sticks, but I always change it up when using this song in a class or music therapy session. It’s also fun to let my students take the lead, choosing different ways to play. I’ll be posting lots of vacation pics soon, but right now we’re in recovery mode and just trying to get back into the swing of things. As far as baby news goes, I have my first shower today and I’m very excited! I’m not so excited about my appointment with a hematology specialist tomorrow to discuss my low platelet count. But as far as complications go, this is a small bump in the road according to my OB…so I’m trying not to let it freak me out just yet. Enough about that, though. I’ll share updates after I know more — until then, I’m going to enjoy the much more FUN parts of pregnancy.